Despite the "commandment" about not having "strange gods," the good Fox News Christians have deified Tim Tebow and anyone who dares to invoke the name of Tim Tebow in a less than reverential tone will be hauled before the Fox News Inquisition that, on Sundays, includes, appropriately, Fox News' official clergy person who is a Roman Catholic priest. And given the nature of the historical Inquisition it was only fitting that Foxpriest Fr. Jonathan Morris and the Sunday "friends" pillory a rabbi who wrote an article which used the new right wing savior, Tim Tebow, as a focal point to talk about the dangers of religious certainty vis-a-vis the Christian right. He didn't diss Tebow but you wouldn't have known that from the conversation on the curvy couch. The original article, which was misrepresented on Fox Nation, has been removed, most likely as a result of anti-Semitic comments, from Jewish Week Online. Thanks to Fox & Friends & their priest, there'll probably be lots more of those, praise Tim Tebow! Tim Tebow is a perfect metaphor for Fox News' bogus culture war as he represents what is seen by the Christian right as the perfect Christian beginning with his birth to a mother who was advised to abort him to his outward displays of his Christianity on the football field. Despite any actual examples, Fox hosts claim that Tebow is mocked by the sports community and the media for his Christianity. Voila - the perfect good vs. evil, us vs. them meme that Fox so loves. It feeds into the victimized Christian meme, too, in the Fox News sports article questioning whether a Muslim player would be given the same treatment as Tebow. It was even suggested that the "Tebowing" craze was done to mock Tebow's Christianity when it's just a goofy thing akin to planking. Interestingly, the young man who began the Tebowing fad is a fan of Tim Tebow's. But he's also Jewish and given the content of yesterday's Sunday with Father Morris segment, one wonders about a pattern on a "news" channel that employs only one Jew in a prime time slot (Chris Wallace) while the rest are, for the most part, Roman Catholics. Last week, Fox Nation ran this headline: "Columnist: If Tim Tebow Wins the Super Bowl Christians Will Be 'Burning Mosques, Bashing Gays and Indiscriminately Banishing Immigrants'." This was a section of an article by Rabbi Joshua Hammerman in which he states that the Tebow phenomenon provides "fodder to a Christian revivalism that has already turned the Republican presidential race into a pander-thon to social conservatives." As we have seen with the Fox Tebow coverage this is on point. The rabbi quickly removed the Fox Nation headline quote from the article but Fox Nation didn't change its headline. The quote is still part of the whole article on a Catholic website and the white supremacist site, "Storm Front," which is drawing some really nasty anti-Semitic comments. So here's where Fox's one true priest comes in. Fox & Friends, as seen in the opening chyron, defines this as a "controversy" and incorrectly claims that the rabbi is criticizing Tebow's faith which given the rabbi's quote, "I admire much of what he stands for," doesn't appear to be true. Dave Briggs quoted from the article which is no longer available. Briggs noted that the rabbi apologized but asked "is the damage already done." Briggs read "the worst part" which is the quote that was removed from the original article. 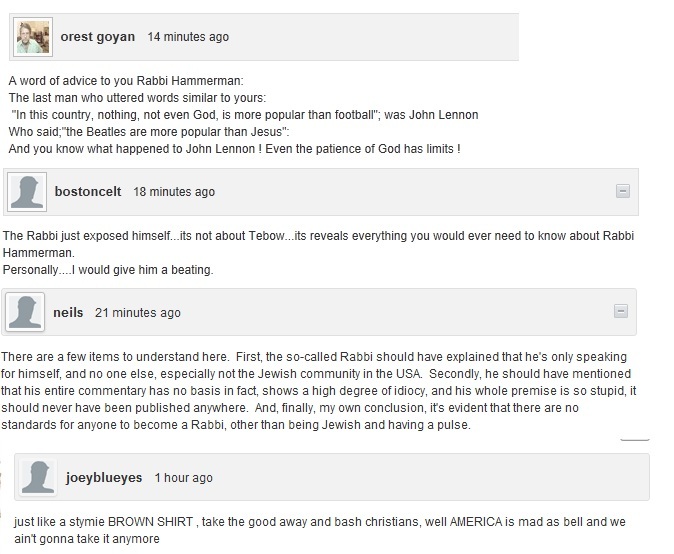 (The graphic, with the quote, had a Christian cross next to "Anti-Tebow rant, rabbi sparks controversy." ) Fr. Morris validated the quote and quickly noted that their criticism has Nothing To Do with the fact that this man is a rabbi. The propaganda padre also cited the apology and then reinforced the patented Fox meme about "some people" who "don't like Tebow's faith and the way he expresses it" and this is why the rabbi says that Tebow is a "poster boy for the religious right." (Ya think!) After the apology, to "Mr. Tebow" was read, Briggs suggested that he apologize to Christians. The chyron reinforced the agitprop by, again, defining the article as an anti-Tebow rant. Doing his best dramatis persona, Fr. Morris insisted that the rabbi was wrong about a Christian uprising. Clayton Morris wanted to know how Christians should respond to "this type of attack." (Lots of death threats?) Fr. Morris said that it should be discussed, as they did, in a rational way. The end of the segment was a video of the cute, little priest riding a mechanical bull and looking very butch. Rational? Excuse me? The discussion missed the whole point of the article but that's not surprising given that Fr. 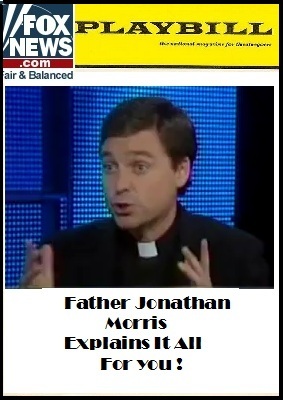 Morris' contemporary Catholic Church is all about the certainty of blind obedience. What would have been rational would have been to have another rabbi provide some perspective - as opposed to a Catholic priest who is a mouthpiece for the religious right on a network that is the national mouthpiece for the religious right. One hopes that Fox "News" isn't using anti-Semitism in its Christian crusade cuz that's when things get really ugly as seen in the comments on Fox Nation and Morris' Facebook page - comments that underscore the reality of which the rabbi is keenly aware. Post Script - Jesus must have been asleep at the switch yesterday as the team from evil gay marriage tolerating New England (my beloved "Pats") vanguished his team! Threatening Fox Nation comments prove rabbi's point? Is Teeboner the Anti-Christ? If you add the numbers on his jersey (1+5) you get “6”. He is listed sixth on the Broncos numerical roster. Last season, he scored six touchdowns. 6-6-6? Mere coincidence? Just asking. So, next season when Tebow gets benched because he’s crappy and President Obama gets re-elected, will the Fauxians declare God dead? Since Tebow was on the cover of Sports Illustrated last week, it proves once again that the Sport Illustrated cover jinx strikes again.